When you say the idle isn't smooth, do you mean it just feels "lumpy" when you're seated in the car, or is the rev counter hunting up and down ? If it's hunting between 800-1000rpm or more, then yes, it should be possible to improve it with some detail attention to the ignition timing, air flow through the individual chokes (idle screws), air filter leaks, etc. On mine the rev counter is fairly static at roughly 800-900rpm and unlike a modern car at you can feel a slight vibration from the driver's seat. Not a great deal but noticeable when compared with a modern mid engined car which at those revs you wouldn't feel the engine running. (Elise, MR2, etc) It's always been like that, so if yours is the same then it's a "period feature", not a fault ! Well after a long delay due to life deciding it had different plans for me than what I was planning, I'm finally able to get back to work on the Europa. 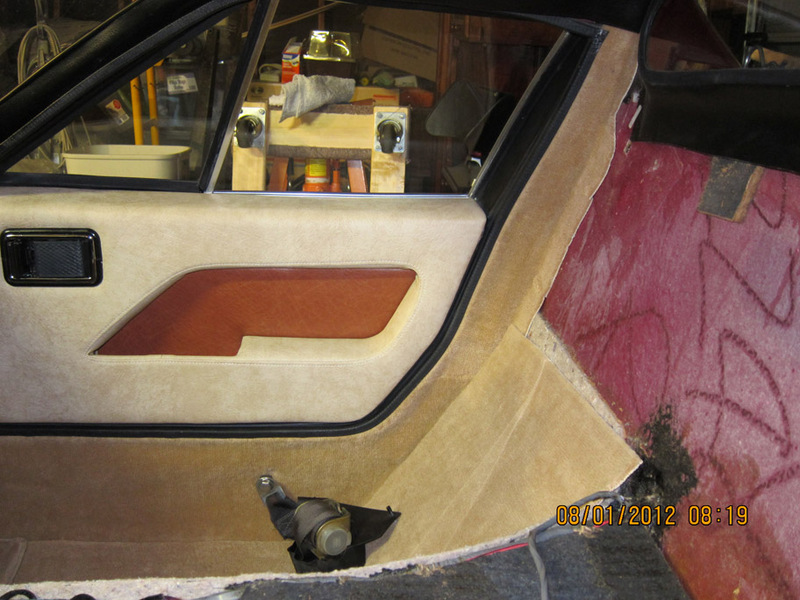 I got new door panels and an oatmeal carpet kit from Banks Europa. 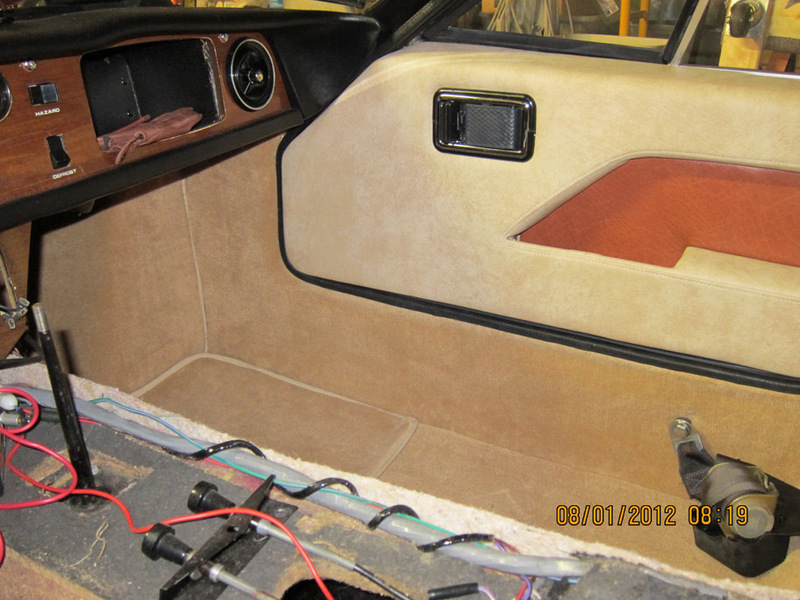 Here you can see the door panel and I've gotten the removable rear cabin panel carpeted. At some point in time there had been either standing water or the carpet had gotten really soaked so there was rust and corrosion on the metal parts, i.e. 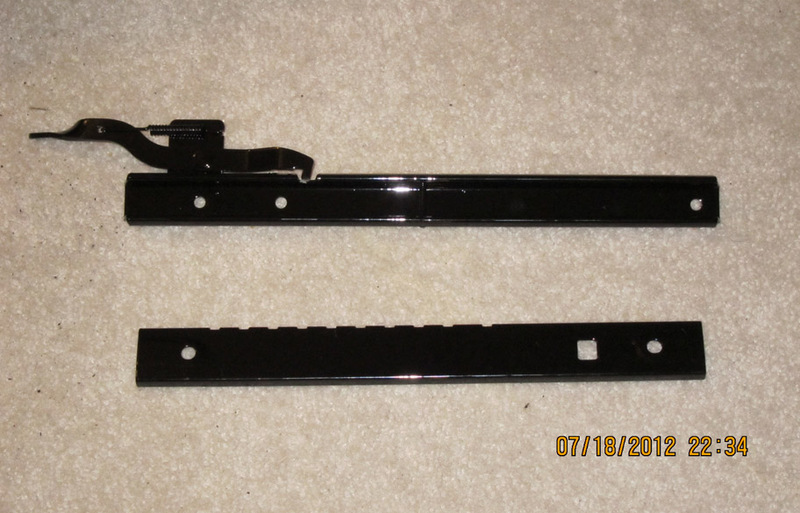 seat rails, seat belt bolts, etc. The carpet was rotted so I removed all the carpet and padding. 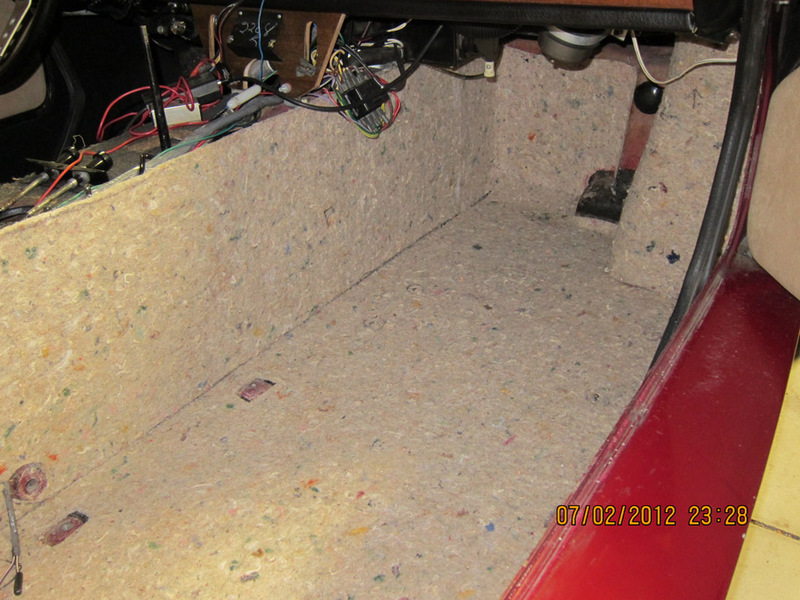 Here you can see I put in some Damplifer vibration control mat to help dampen cabin resonance from the headers. 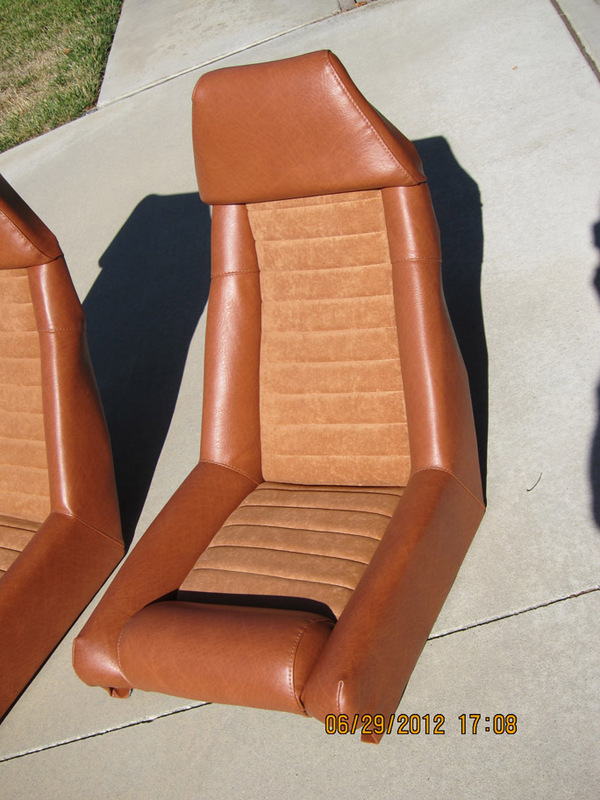 I took the seats to a local shop and had them redone; the centers are cloth. Here you can see I've started on the passenger side to replace all the rotted padding. The seat rails had various amounts of oxidation, corrosion and rust on them so I had them sand blasted and powdercoated in gloss black. They turned out really well! I also got new stainless bolts and washers to mount them on the floor when I get to that stage. I've gotten most of the carpet done on the passenger side (I also redid the inside of the door panels to match the seats). The weather has been too hot to do much. It's not only hot in the garage but I've also got to work inside the car so it hasn't been possible to do much but I'm poking along in bits and pieces. The driver's side is more complicated due to the pedals and linkages but I've gotten all the old carpet and padding removed. 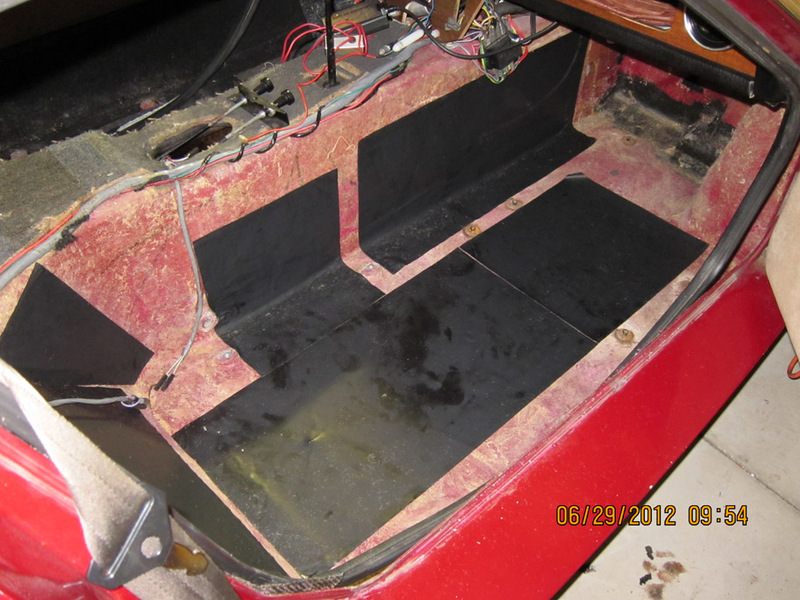 If it cools down a little bit I hope to get the center console carpeted and put back together and at least the passenger seat installed. Nice work on the interior bits. That is looking quite tidy indeed. That's looking really good! Did you keep your original choke cable? If you got a new one, where did you get it? This might be repost of mine. My Elan choke cable was NLA. The knob was fine tho. I went to piano tuner shop and bought the heaviest wire/string he had, for a few bucks. Must be heavy due to push/pull actions req'd. Brazed that to knob. Never failed. Europa Fan: Love your work, no corner cutting, work done to last. Great. Yes I've kept the original choke cable; it's working just fine. I lost my choke cable so I don't even have a knob. I'd need a longer one than I had for the Strombergs because I think the cable has to enter from the rear because of the way the choke works on my Webers. Maybe I could get around it but since I never had a cable, I didn't worry about it that much! I think it is Moss Motors who has a very similar cable but because it's for a front engine car, it's not long enough. Maybe I can do some sort of splice?? Chris (The Kid#9) and I replaced our choke and heater cable with a solid wire one from JEGS. Cheap and works great! Also we didn't have the hold down for the choke cable at the carb, and I used a Jag XK6 clip for the Stromburg carbs. Got it from Moss I believe. It fit perfectly and holds the choke cable fine. We had to shorten the heater cable about a foot. Well it's been a LONG time since I was in here. Finally got the interior mostly done (about 99% finished) and now I find I'm going to have to sell it due to a job transfer and moving to another state. The car pretty much just needs a new windshield (crack in it) and a new paint job. The front upper ball joints need replacing; I have new ones, just need to be installed. I have new badges for the sides and new LOTUS letters for the rear deck lid. Interior-wise the sun visors need to be redone and it needs either a cover plate for the radio slot or a new radio. I was going to get one from Retrosound since they make one that would fit and work with the old style cars but the new owner can do whatever they like. Seatbelts need refurbishing and I couldn't reinstall the buckle holder on the passenger side because the bolt wouldn't thread. Either needs a new bolt and/or the threads in the hole recut with a tap and die. Steering wheel leather needs to be redone. That's about it for the interior. 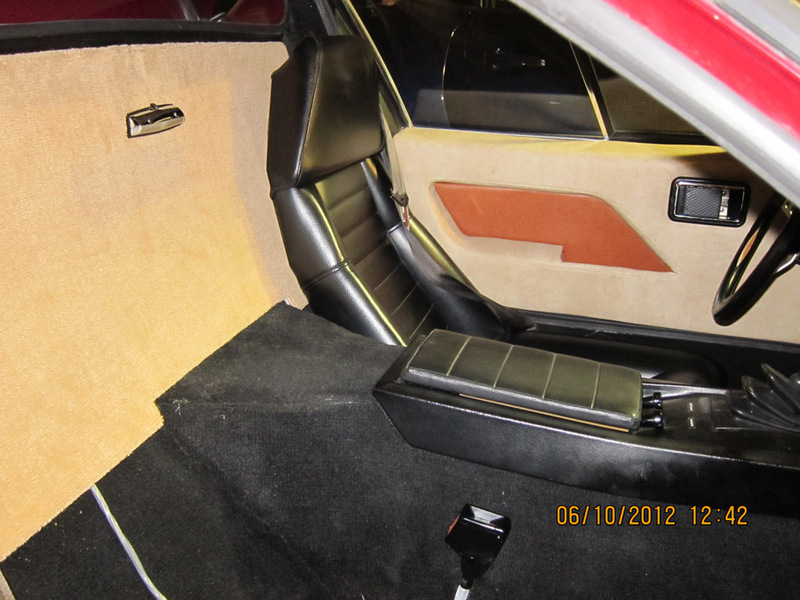 It has new padding, new carpet, seats redone, new door panels and new inside door latches. Door locks work; inside latch and outside with the door key. All the electricals work; all the lights work. All the gauges on the dash work. You can read in this thread all the many things I did to this car. Because the windhshield has a crack and needs replacing, I'm only asking $15k for the car. With a new windshield and paint it will definitely be worth more than that. What a drag! So sorry you'll have to give up your project car as it was just coming together. Hopefully you get your price and after you get settled in your new situation, you can take up another project! The car has sold to a new owner in Florida. I thank everyone who showed interest and was supportive during my project file journey with one of Colin Chapman's finicky but magical creations.